Six years since taking office, Thomas College President Laurie Lachance can point to many accomplishments. 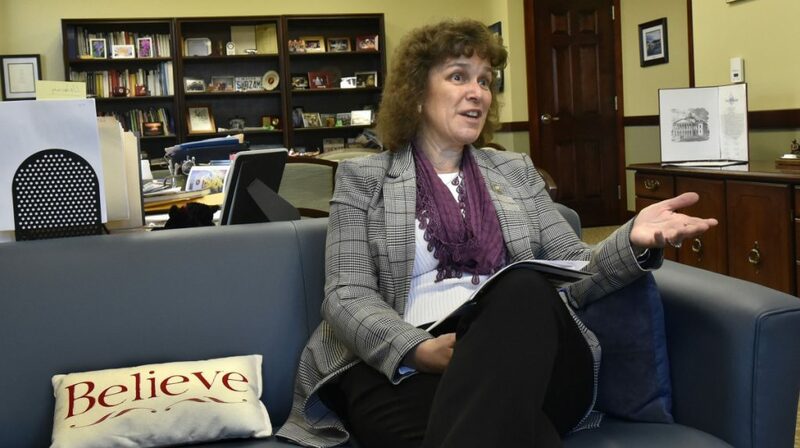 WATERVILLE — Ask Thomas College President Laurie Lachance about the school’s greatest accomplishments since she took office six years ago, and she’s quick to point to a number of million- and multimillion-dollar investments that are the largest the college has seen in its 125-year history. There’s a $1.7 million donation from the Lunder Foundation in 2015 to launch the Center for Innovation in Education; a $1.1 million grant from the U.S. Department of Education to address the needs of low-income students in 2016; and, in 2017, a $5.3 million investment by the Harold Alfond Foundation to establish the Harold Alfond Institute for Business Innovation. That came on the heels of $4 million from the Alfond Foundation for the construction of the Harold Alfond Academic Center, housing a new library and classrooms, in 2013. “We’ve always been a place that welcomes students of promise and gives them the support and personal attention to help them thrive. It’s always been a strength of ours,” Lachance said from her office on the West River Road campus. The college, which celebrates its 125th anniversary this year, has nearly doubled its enrollment in the last 25 years and has added eight new buildings, including an athletic center, in the last 20 years. Its endowment has grown from just $373,325 in 1993-1994 to $13.2 million. But there have been challenges. Chief among them is Maine’s demographic as an aging state with a shrinking population of high school graduates and a graduation rate that lags behind the national average. Ayotte said while enrollment has grown, the college wants to hit a target of 1,000 full-time undergraduate students – up from its current 772 – in order to be financially sustainable. Currently, about 78 percent of Thomas students are from Maine. About 45 percent are eligible to receive federal Pell Grants, meaning they have exhibited exceptional financial need, so another challenge is trying to squeeze more value into a Thomas College degree while maintaining affordability. The school has a six-year graduation rate of 48 percent – which Lachance said is on par with peer institutions – but falls short of the national average of 59.8 percent for four-year schools, according to the National Center for Education Statistics. Since 2016, Thomas has received two major federal grants to address the needs of first-generation and low-income students. The first, the TRIO Student Support Services Program, granted Thomas $1.1 million, which has created programming around academic success, such embedding tutors into difficult classes. Kyle Greene, a sophomore and Student Senate president, said that programming has been instrumental to students. Earlier this year, the college also received $2.3 million from the U.S. Department of Education’s Title III Strengthening Institutions Program. Both grants have helped or will help the college engage in creative programming, such as the EDGE program, which was celebrated this past summer for its effectiveness in helping first-generation freshmen adopt to college life by bringing them onto campus early for a 10-day intensive class. Other long-standing programs, such as the Guaranteed Job Program – which guarantees job placement within six months of graduation or the school will pay a student’s federal loans – also have been successful in boosting retention and a student’s success after graduation, Lachance said. The program was cited by Greg Powell, executive chairman of the Harold Alfond Foundation, as one way the college is building relationships with local businesses and boosting central Maine’s workforce.